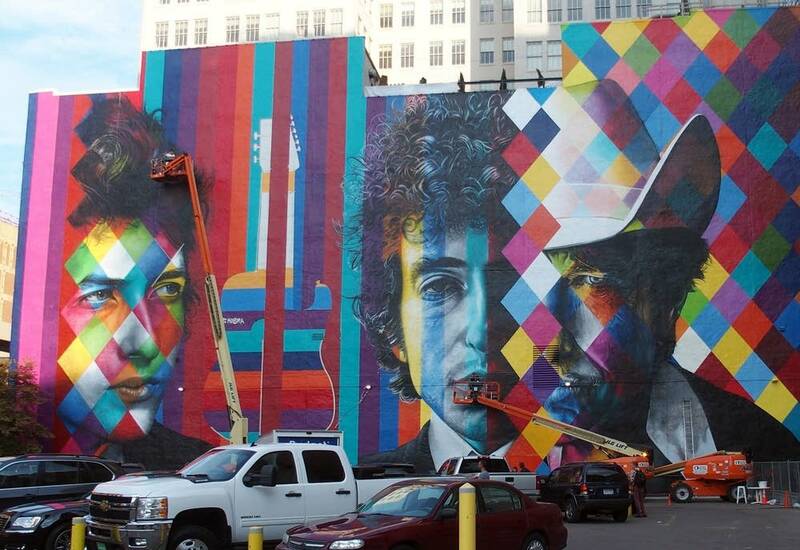 A small crowd gathered at the corner of 5th and Hennepin in downtown Minneapolis today to watch Brazilian artist Eduardo Kobra sign the huge brilliantly colored Bob Dylan mural that he and his team of five painters created over the past two weeks. Entitled "The Times They Are A-Changin'," the piece features three photo-realistic images of Dylan; one as a young troubadour early in his career, a second from years later, and finally a third more current image of the singer wearing what's become his trademark white hat. As with other Kobra murals, the images are overpainted with an eye-catching kaleidoscopic pattern that makes it visible from blocks away. 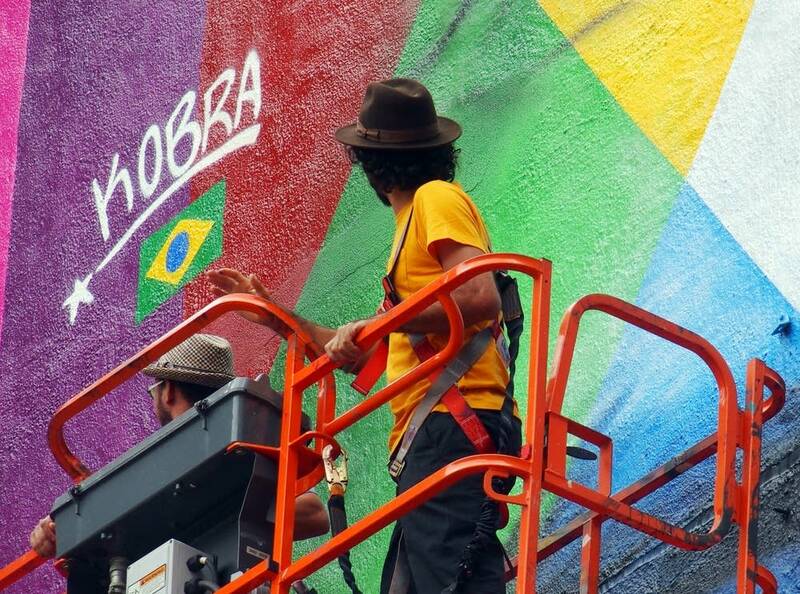 The crowd cheered as Kobra finished his signature, set above a small Brazilian flag. He then turned and gave a thumbs up. Speaking through a translator, Kobra, who has produced iconic murals around the world, said he was pleased with the finished piece. He said his team worked a lot and worked hard and they are very happy with the results. 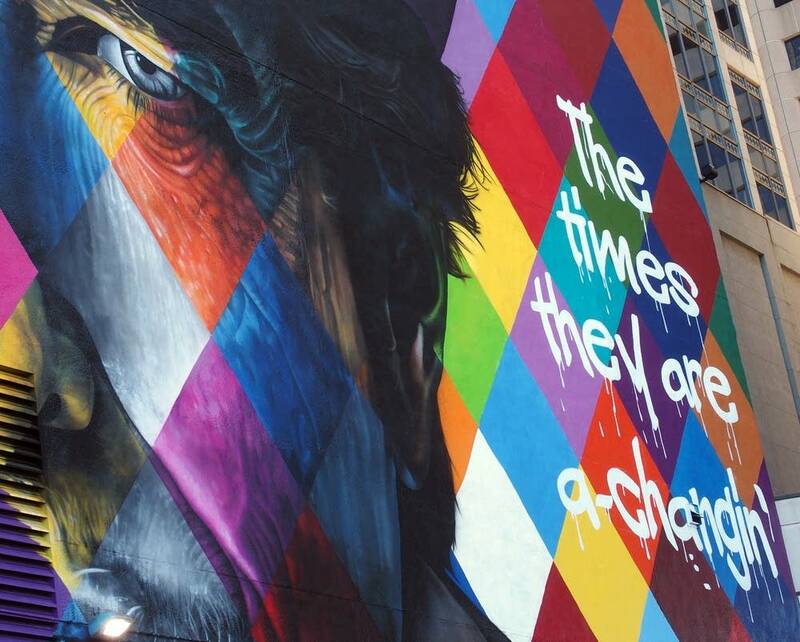 This is the largest wall Kobra has worked on outside Brazil, and he said the project helped him once again realize the importance of his team. "Each one is essential," he said. 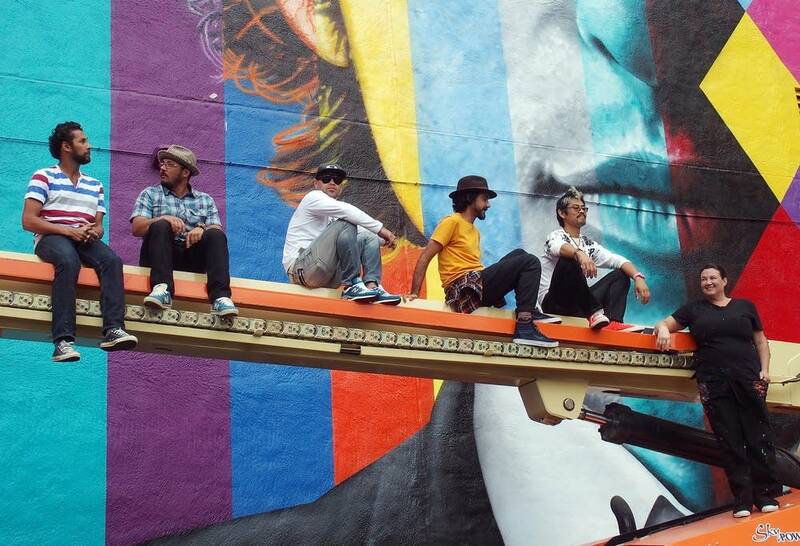 "If one of them had gotten sick, they wouldn't have been able to complete the mural. They wouldn't have had time," he said. 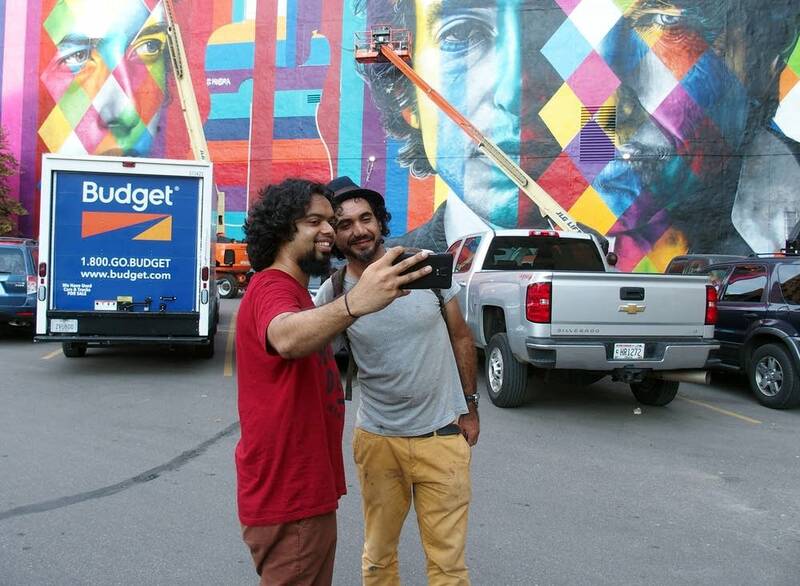 Work began on the project August 26, and the team of four Brazilians, including Kobra, and two Minnesotans has been painting for 12 hours a day ever since. It is 160 feet wide, and five stories tall. Minnesota muralist Erin Sayer says part of the challenge was they found the wall was significantly bigger than they expected when they began to paint. In fact they realized they had an extra 280 square yards of area to cover. "It was 20 feet taller than they said," laughed Sayer. "Yeah! It's just one of the things that happens when you don't really know what you're going to do until you get in front of the wall and see it for yourself." Sayer said they not only had to change the design slightly, they also had to get a taller hydraulic lift so they could reach the top. She shook her head when asked about the experience. "It has been surreal. Its been a lot of work It's been a lot of fun." The project was managed by the Hennepin Theatre Trust. President and CEO Tom Hoch joined the praise for the final mural. "I think it's amazing," he said, "and I think the throngs of people who have been standing around watching for the last two weeks probably agree with me." Hoch said part of the impetus for the project is to act as a glue for the downtown cultural district. "This took a blank wall and has now made it into a picturesque place for people to gather, to talk," he said. "And if we can do more of this just like this we will really begin to achieve our objective. "It's just so awesome and they did it so quickly," he continued. "I was here each day looking at it and to see it come to life has just been such a tremendous experience." Kobra began his career as a street artist, and he understands the mural may attract the attention of taggers. He says his career is based on respect for the works of others, and even when he has painted over the work of other artists this has been done with respect. He says he now hopes others will afford him the same courtesy. 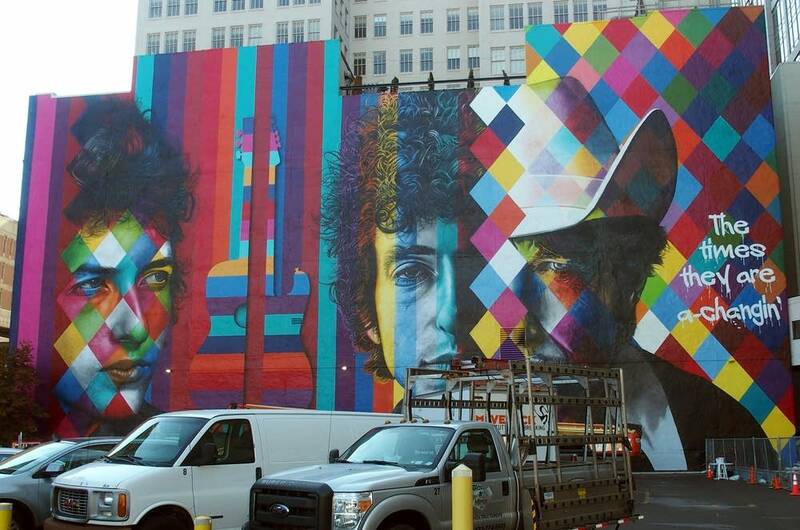 He also hopes that at some point Bob Dylan will come and see the mural, and that he likes it.